The answer conceived by the Big Bank Five: eliminate controls on banks in every nation on the planet ”“ in one single move. It was as brilliant as it was insanely dangerous. Until the bankers began their play, the WTO agreements dealt simply with trade in goods”“that is, my cars for your bananas. The new rules ginned-up by Summers and the banks would force all nations to accept trade in “bads” ”“ toxic assets like financial derivatives. And so on”“with every single nation bullied into signing. The new FSA pulled the lid off the Pandora’s box of worldwide derivatives trade. Among the notorious transactions legalized: Goldman Sachs (where Treasury Secretary Rubin had been Co-Chairman) worked a secret euro-derivatives swap with Greece which, ultimately, destroyed that nation. Ecuador, its own banking sector de-regulated and demolished, exploded into riots. Argentina had to sell off its oil companies (to the Spanish) and water systems (to Enron) while its teachers hunted for food in garbage cans. Then, Bankers Gone Wild in the Eurozone dove head-first into derivatives pools without knowing how to swim”“and the continent is now being sold off in tiny, cheap pieces to Germany. While billions of sorry souls are still hurting from worldwide banker-made disaster, Rubin and Summers didn’t do too badly. 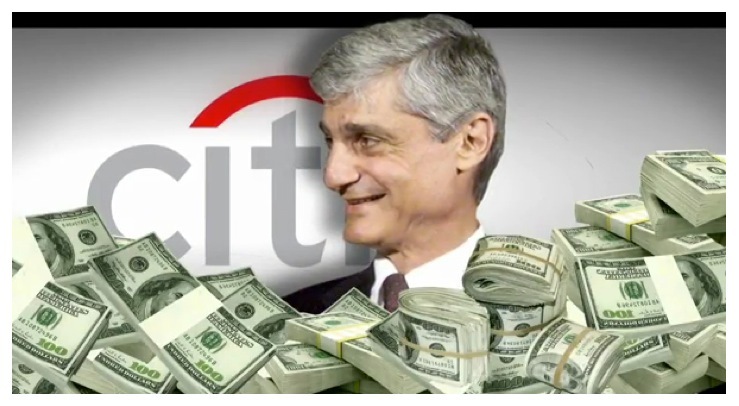 Rubin’s deregulation of banks had permitted the creation of a financial monstrosity called “Citigroup.” Within weeks of leaving office, Rubin was named director, then Chairman of Citigroup””which went bankrupt while managing to pay Rubin a total of $126 million. Further discussion of the documents I laid before Lamy can be found in “The Generalissimo of Globalization,” Chapter 12 of Vultures’ Picnic by Greg Palast.